They say success is 80% mindset and 20% tactical. In all areas of life, I couldn’t agree more. 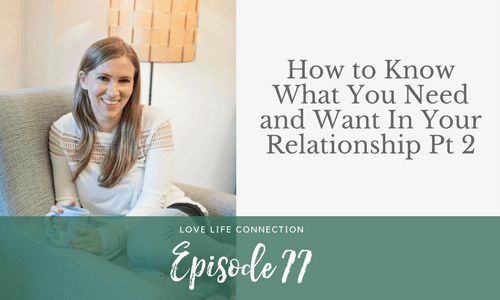 And what’s why when I got the request to do a podcast episode on discovering what you need and want in a relationship, I knew I had to break it down into two parts: the why and the what, and then the HOW. Last week’s episode, which was part 1 in this 2-part series was about the mindset and importance of discovering what you need and want in a relationship. And this week’s episode is all about putting it into practice. Knowing what you need and want doesn’t do you any good unless you know HOW to ask for it in a way that’s effective. Most conversations I find are so ineffective. Conversations between coworkers, lovers, parents and kids, and employers and employees are riddled with blame, judgment, and accusation, which isn’t going to get you anywhere. So today’s episode gets into the nitty gritty of how to have an authentic conversation. I go into the weeds here, and since I’m guessing that maybe you’re listening to this episode while you’re walking, driving, or doing something else, I created a freebie you can refer to. This freebie has some important questions you need to ask yourself BEFORE you ever have this kind of conversation, and it outlines step by step what to do.